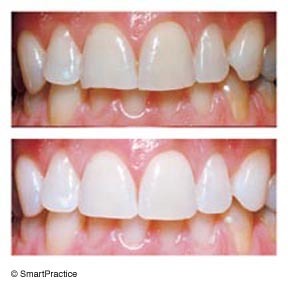 Discolored teeth can be whitened with a simple, painless procedure. Whitening your teeth has never been easier. Trèswhite’s innovative preloaded whitening trays are simply inserted onto your teeth for a comfortable fit. The thin membrane tray adheres to the teeth and remains securely in place for the 60 minute wear time. Yes, only 60 minutes, once a day. It’s that easy. Trèswhite is the most powerful take-home product available. Because it contains such a high concentration of peroxide, results are achieved rapidly. Some people see results in as little as one day. Now that’s fast. Impressions of your teeth are created that allow for custom trays to be made for your bleaching procedure. Whitening gel is placed in thin, comfortable trays and fitted over your teeth. As you whiten your teeth, carbamide peroxide is broken down and oxygen enters the enamel and dentin. This bleaches out the discolored areas. The structure of the tooth is not changed. The color of the tooth is simply made lighter. Results are often seen after one night. Optimum natural whiteness usually occurs when the process is continued for a week to 10 days. Individual results and time needed to achieve desired whiteness will be unique to your own situation.